This chapter explores the relationship between the Ellis Model of Information Seeking Behavior and the scientific community of Venezuela. The research employs a qualitative method to investigate the main information seeking activities of a scientific community in the periphery in the context of dependency theory. The following elements of the Ellis model are supported by the data gathered and analysis: starting, browsing, chaining, filtering, extracting, and information management. Access to scientific information is essential to the scientific endeavor, the process of creating scientific knowledge, and the scientific community. The primary channel for the communication of scientific information is the scholarly journal (McCain, 1989). Journals are composed of papers that are linked to each other by the use of citations, forming networks of knowledge (Price, 1965). There are other ways to communicate and disseminate scientific information, including personal communication, textbooks, conference attendance, conference proceedings, preprints, social media and digital content (Brown, 1999; Price, 1963; Tenopir, King, Edwards & Wu, 2009). However, accessing and examining current research published in refereed journals is paramount to scientific research (Kirsop, Arunachalam, & Chan 2007). The accessibility of sources of scientific information is determined and mediated by the availability of funds and by the existence of an infrastructure capable of supporting access to the information by the scientific community (Arunachalam, 2003). The rising price of scientific information is a concern in academic libraries around the world, because it is limiting the number of subscriptions that a library can afford to hold (Kirsop, Arunachalam, & Chan 2007; University of Illinois, 2009). Many academic libraries are canceling the subscriptions to individual journals and specialized databases and indexes. There has been a price increase in journals of 178.3% between 1990 and 2000. It is reported that a subscription to one scholarly journal may costs in an excess of US$20,000 a year. Many academic libraries have seen their budgets decrease by at least 3% from the 1980s to the present (Scientific Journals International, 2008). The increasing cost of scientific information is affecting universities and research institutions all over the world. Only those institutions with enough funds are able to maintain their collections of print and electronic subscriptions, and thereby continue to provide to the scientific community the desired level of access to current and reliable sources. This situation, which has become increasingly problematic in the U.S. and Europe, has become critical in the case of countries in the periphery. “Periphery” refers to regions with monopolized, underdeveloped or developing economies. “Core” refers to highly developed regions with diversified economies (Cardozo, 1972; Valenzuela & Valenzuela, 1978). 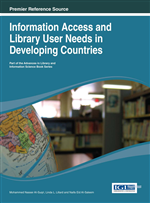 For nations in the periphery, access to scientific information is even more limited by a lack of funds, inadequate infrastructure, and in some cases, language difficulties (Kirsop & Chan, 2005; Kirsop, Arunachalam, & Chan 2007; May, 2006).